It took me a long time to stick my New Year's resolution of getting healthy and stronger. I tried so many different things, but nothing stuck. I resolved I might be one of those people who never uttered the words "joy" and "exercise" in the same sentence. 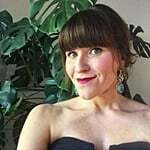 Then, two years ago, on a whim and with a little convincing from my best friend, I tried The Bar Method. To this day, I take classes five and sometimes six times a week. I spring out of bed every morning at 5 a.m. and put on my grippy socks to ensure I don't miss one of my favorite hours of the day. But it wasn't always that way. X-ray of my spine prior to surgery. The x-ray has a note from the doctor of 50-degree curvature in my spine. As a child, I was never very active. I did gymnastics, but I was never into sports. 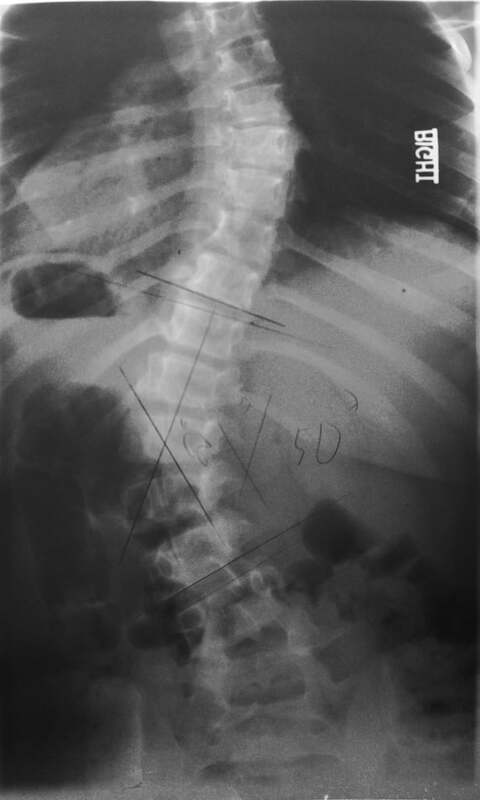 My love of gymnastics came to a grinding halt when I was 10 years old and learned that I had a pretty severe case of scoliosis (curvature of the spine). 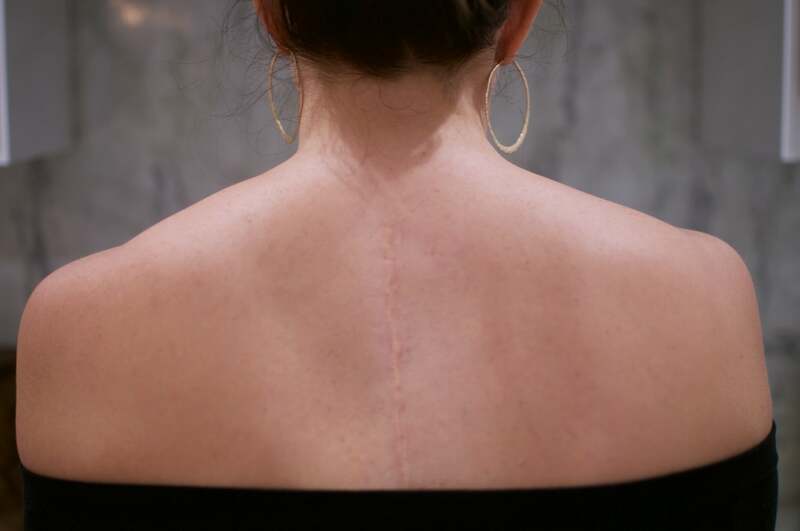 In just one year, I endured three extensive surgeries. I don't want to go into too many gory details, but the ordeal involved rib removal, spine twisting, and a Herrington rod (metal rod that was inserted and screwed into my spine along one side to straighten my spine) coming loose. When it was over, I was three inches taller but a hell of a lot less flexible. Prior to the surgery, I could do backbends and bridges, but afterward, I could only move at my neck and bend at my hips — everything in between was as straight as an arrow. With this limited flexibility and my exceptional caution, I just stopped being active, and I always had a doctor's note that allowed me to pass gym with little effort. I knew after my surgeries I would never gain the same flexibility, but I should have been able to maintain strength. Unfortunately, the fear of more surgeries and just exceptional caution led me to a path of weakness in both my core and back. When I heard friends say they loved exercise, I thought they were crazy, but deep in the back of my brain, I was a little jealous. As an adult, I would entertain the idea of exercise for a few months — with yoga, crazy circuit training, and gym memberships — but nothing stuck, and I hated all of it. Looking back now, I realize I was always haunted by my three back surgeries; I was fearful that overexerting myself would result in more surgeries. And after years of babying my back, much of my muscle had atrophied. But then I tried The Bar Method — a low-impact, full-body workout that utilizes a ballet barre for many of the exercises and stretches. From the beginning, the classes were incredibly hard and intense, but to my surprise, I found myself craving them. I started slowly, going no more than three times per week, and I always did the easy or modified versions of the exercises. A common foot position, especially for thigh and seat work in The Bar Method, with my favorite grippy socks. Throughout those early classes, my back never hurt and I never felt as if I couldn't do the exercises. The amazing Bar Method teachers taught me which exercises I needed to modify and truly helped me focus on engaging my back and core (muscles I hadn't used in years, but I could feel my muscles' memory kicking in). Within the first couple weeks, my first win was when I realized I could stand up, bend over, and actually touch the floor. I hadn't been this flexible since I was a kid. 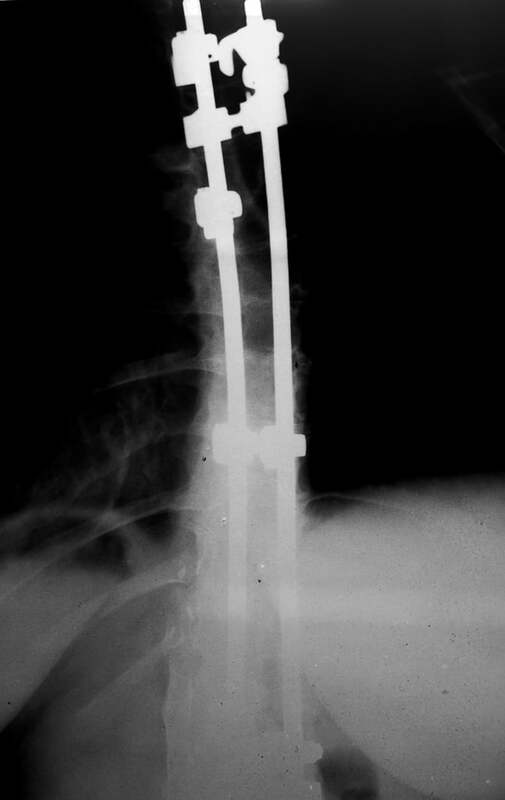 X-ray of my spine after the three surgeries, which included fusing two vertebrae and two Herrington rods to align my spine. After several months, I began to understand the joy of exercising regularly: not only did it help clear my head but also I left class with less stress. A common phrase you hear from instructors in Bar Method class is "good choices" when you challenge yourself just a little more, like going from doing push-ups on your knees to doing them on your toes. In turn, I began to focus on my own wellness and to realize that life is full of choices, both in barre class and out. I slowly increased my schedule to five classes per week, and after the first year, I switched to the 6 a.m. class from the evening classes to ensure I never missed a session. Every class, I challenge myself to try something new or just to stretch a little further. If I am tired, I trust the instructors, who come to know your abilities and always push you a little harder. It took me 20-plus years to discover the joy of exercising — and my love for it wasn't instant. It took time and the realization that those small challenges and movements during class have changed my body, helped me gain muscle strength, and improved my flexibility throughout. Yes, I also lost weight, but honestly, I am more proud of the strength I have gained over the last two years, and I have slowly gained confidence in my back! If you have had scoliosis surgery or other back problems or just haven't found "your" exercise, I highly suggest trying The Bar Method. If that doesn't ignite your passion, keep looking; you never know when you will find the thing that makes you spring out of bed every day at 5 a.m.